Traditionally, this would be cooked in the earthenware cooking vessel known as a tagine (of which I wrote here), but the recipe below has been modified for preparation in more common cooking vessels, so you can enjoy it even without owning a tagine. However, so common is the cooking method that the dish (and other tagine-cooked dishes like it) is also known as a tagine. Okay–so you’ve made your preserved lemons, right? If not, look at the last post, and a week from now, you’ll be ready to make this salad. This delicious, refreshing salad is Moroccan. It’s a great side dish for summer barbecues–it can’t be beat with meat. But if I’m serving it alone, or with something less robust, I’ll substitute a sweet onion for the more pungent red onion. 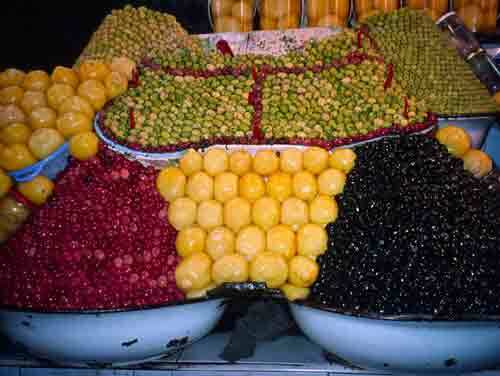 A handful of ingredients stand as cornerstones of Moroccan cuisine. One of those things is preserved lemons. The preserved lemons in the image above were preserved whole, which is very dramatic looking and may be more authentic, but it takes a month. The recipe below is for “quick” preserved lemons — it only takes a week. These add a distinctive flavor to many Moroccan dishes, some of which I’ll share with you once you’ve made your preserved lemons. Try to find lemons that don’t have terribly thick skins. They should be ripe and fragrant. Scrub the lemons and dry them well, then cut each one into eight wedges. Toss the wedges with the salt and place them in a 1/2-pint glass jar with a plastic-coated lid.